""How long have you been married for?" Alice interrupted. The terror of not knowing the facts of her own life gripped her again. She was on one of those amusement park rides that slammed you left, then right, then turned the whole world upside down, giving you unfamiliar glimpses of familiar things. Alice hated amusement park rides." I could actually feel her uncertainty and fear. The story examines looking at the blessings of your life and what might be important and what isn't. It explores the workings of family relationships and what interferes with them. The story is told from 3 voices: Alice, her sister Elizabeth who has desperately been trying to have a baby and can't, and that of her beloved grandmother. The story was thought provoking, funny in a lot of places and also sad in some. 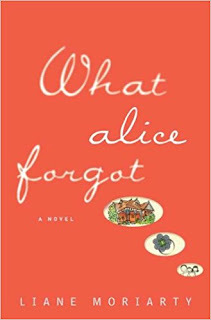 For the most part I enjoyed the story and really wanted to find out what happened to Alice and if she would settle within herself who she had become if her memory didn't return. The author gave enough vague references to Alice's former life that kept you turning the pages to find it all out along with Alice though a few sections of the book did drag on a bit. That does sound like an interesting premise. I've had this on my list for a long time. Good to know you liked it. I've only read two of this author's books and this wasn't one of them. I really liked Truly Madly Guilty. Maybe I will look for this one. Great review!